Anil has been DJing at both public and private events for over ten years. Equally comfortable at both formal events and dance clubs, Anil knows how to keep any evening moving smoothly-- from the elegance of a ceremony or corporate meet-and-greet to the high-energy party at the end of the night. Steve has recently relocated to San Diego from the Bay Area, where he was working for one of the largest and best-reviewed mobile DJ companies. He is truly a class act and a well-seasoned DJ, and we're very lucky to have gotten him! Greg is both a musician and a DJ, so he can do either one, or both, at your event. Greg plays guitar and sings all over San Diego, and his recent residences include The Hotel Del Coronado, The Bahia Resort, and Southcoast Winery. With his lifelong passion for all things music, he is equally comfortable DJing Top 40, EDM, country, oldies, jazz, latin, or any combination! With over 20 years' experience as a professional musician, Joe specializes in solo Classical, Jazz and Latin American guitar styles-- including flamenco, tango and Brazilian. But because he is so involved in the local music scene, Joe can also perform as a duo with another guitar, violin, flute or just about any other instrument you might want. Learn more about Joe and listen to audio samples. Marta is an international performer and recording artist. Originally trained as a classical solo, chamber and orchestra musician, she later crossed over to jazz, latin, pop, EDM and other styles. She's worked with Stevie Wonder, John Williams, and Rihanna, among others, and continues to be a driving creative force in the San Diego music scene. Bryce has played violin and viola in San Diego for over 20 years at events and with various orchestras and theaters. He also leads our string quartet, striking that perfect balance of elegance and entertainment with both their traditional repertoire and their classical arrangements of popular songs. Learn more about our string quartet and listen to audio samples. Ed is one of the busiest musicians in San Diego, playing at both private and public events, backing up musicians and vocalists both live and in the studio, performing with numerous bands and combos, and heading up his own projects. 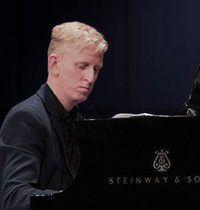 Ed specializes in jazz , pop, and classical styles.